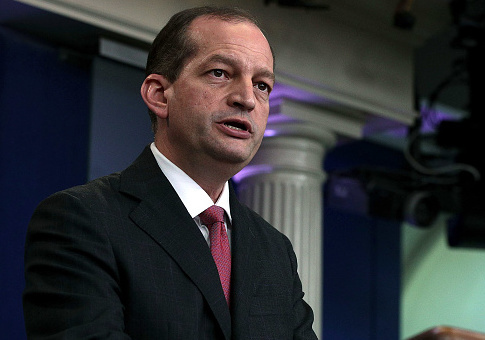 Labor Secretary Alexander Acosta encouraged state lawmakers to rescind occupational licensing requirements that have restricted the job market at the state level. Occupational licensing regulates which workers are able to practice a trade by requiring them to meet standards set by competitors in the marketplace. Licensing has been exercised at the state level to require hundreds of hours of training or costly fees in order to become professional hair braiders or florists. Acosta mocked such systems by pointing to Maryland's requirement that fortune tellers pay a fee of $393.75 and provide three references demonstrating "good character and responsibility" before the person can begin taking advantage of the gullible. "We need to make sure we have integrity in fortune telling," he mused to the American Legislative Exchange Council, a pro-free market think tank, on Friday. He said that the "humor shouldn't overcome the importance of this issue" because licensing has harmed entry-level workers and consumers by driving up the cost of beginning a career. He said that "almost one in three" American jobs now require a license to operate compared to 5 percent of jobs in 1950. While he acknowledged the benefits of licensing in the field of medicine, he said too often licenses are put in place to "limit competition, to bar entry, to create a privileged class, or to prevent people who want to work and have the skills to do the job from actually working." He said that licensing requirements cost the economy $170 billion, which he described as "unacceptable." "Occupational licensing hinders the American workforce … the numbers are staggering and they're unacceptable," he said. "Excessive licensing injures the American workforce … the costs and complexity of licensing creates an economic barrier for Americans seeking a job." Acosta also touted the administration's apprenticeship program, saying that it is designed to supply workers with the training and skills for the modern workforce. He was critical of the American education system for failing to provide students with practical knowledge and said that the Trump White House would focus on "providing skills that actually lead to a job." He said that such a system would help entry-level workers from avoiding the "crushing debt of student loans" and would enhance the economic competitiveness of the United States. "We have a mismatch between the skills the workplace demands and the skills our educational institutions provide for our workforce," he said. "When education fails to focus on workplace skills, education fails our students and our workforce. The apprenticeship model encompasses demand-driven education by providing skills that actually lead to a job." President Trump signed an executive order in June that doubled the federal government's investment into apprenticeship programs to $200 million. The administration hopes that the program will help companies fill 6 million positions. This entry was posted in Issues and tagged Alexander Acosta, Big Labor. Bookmark the permalink.